The dead rise, and only the dead can rock them back to sleep…but sometimes it falls to the living to do what the dead cannot. Author Craig Saunders tells us about his novel A Stranger’s Grave, published by Grand Mal Press, in this new design essay. All right, Genesis may be a little high-falutin for what I do. I’m a straight forward, bash it out writer. I’m not a ‘literary’ writer, and anyone who calls my work literary is apt to get an earful. David Gemmell once whispered in my shell-like that he’d wasn’t the type of writer to go to the ends of the Earth for a paragraph; write 1K a day, and you’ll get there. He didn’t whisper in my shell-like (meaning ‘ear’ for those not down with 50’s colloquial English!) but did impart this tidbit in a throwaway manner at a book signing. I think this was the moment in which I, as a writer, and the ethos behind my work, was born. I write because it’s my job, not because it’s my art. I love what I do, yes. I’d do it for nothing, yes…but I have to eat, too. Well, I’ve only been publishing novels for a year or so. Wouldn’t surprise me if you hadn’t heard of me. Writing’s a tough business, and there are a billion stories out there, by a million writers…to rise above the crowd you’ve got to be good, lucky, and work hard…if you’re interested in finding out more about me and my fiction, though, links *will* follow. Some of you will have scrolled down by now, bored already. Some will read on, maybe. Some of you are off making a cup of tea – I’m not talking to the third group. So, to the crux of this little introduction: Writing takes hard work. How did A Stranger’s Grave come about? Hard work. Pure and simple. I’ll define hard work in a while, but that’s the straight answer. Boring answer, though, eh? I didn’t wander the Scottish highlands with my hands down my trousers, looking for inspiration. Sitting down in front of the computer was more effective…although a few other things gave me a nudge or two in the right direction. My wife. My wife’s work is a big inspiration for me, and a constant source of new ideas. She’s a medium. She has some great stories. One she told me was of the practice of burying still-born children in stranger’s graves, way back when (even as late as the 1950’s)…hearing this, I got the kernel of an idea. I do very little research for a novel – I try not to bore the reader with a barrage of facts and figures. To me, heavily researched books sound forced. I’m not trying to win awards – I want to write page-turners. So I kept the majority of my research secret from the reader. But three witches (I won’t go into detail here – you’ll have to read it!) and the mythology surrounding a certain trio of witches was instrumental in making the novel happen. The third was regulation depth for graves in Norfolk county (England). And there, with three seemingly disconnected facts, I had the basis for a novel. That, in short, is all it took. Then, writing (for me, at least – I can’t speak for other writers) is about getting my bum in the chair, turning the PC on, and bashing keys. Sounds simple, and really? It is. I wrote the first draft in a little over a month, I think. The second draft didn’t take as long. Then, with Grand Mal Press’ editor, the third and final draft. Simplest thing in the world – typing and telling lies. That’s all there is to it! Haha…well, maybe it’s a little more difficult than that. I said early that it was hard work. My definition of hard work is sitting down, typing, for five, maybe six hours a day. I won’t pretend I don’t know what writer’s block is, or that acceptance emails fly into my inbox every day, or that I live in a great big mansion funded by my fat royalties cheques…but the process of writing? I don’t think writing itself should be a chore. I love it. I love what I do. Perhaps it would be more accurate to say that the novel was *a lot* of work. I’ve changed my mind since beginning this essay – it wasn’t hard work. It was bloody good fun. 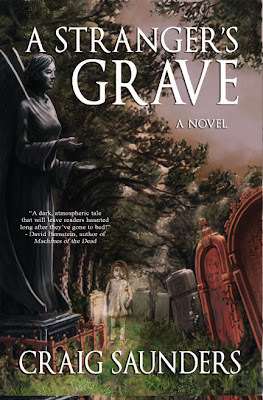 Like I said before, even if I hadn’t sold A Stranger’s Grave to Grand Mal Press, I still would have written the novel. I hope you’ll give it a read, and if not, then I hope that this essay at least will provide some inspiration in that most important of writers’ skills, for the budding writer: Namely, sitting down. Craig Saunders lives in Norfolk, England, with his wife and three children. He pretends to listen to them while making up stories in his head. He has published more than thirty shorts and novellas and a lot of novels. He publishes through the traditional route, and nefariously through the INDIE route…gasp! A horror writer with a side order of fantasy…and science fiction…and humour…an author, if you will, of speculative fiction. He likes cemeteries and wizards, so it was a natural progression to drift between fantasy and horror like a drunk man weaving in and out of traffic. Or, alternatively, search for ‘Craig Saunders Author’ on FB…you’ll find him there, too. One last, last note: Becoming a published author took me nearly seven years…but don’t give up! I published (traditionally) my first novel in 2011. My 13th novel will be published (again, traditionally) in 2012. BattleTech: Blood of Kerensky Trilogy available in eBook formats!